The only cacheable actions are "view" and "history". Also special pages will not be cached. Definition at line 33 of file HTMLFileCache.php. Definition at line 43 of file HTMLFileCache.php. Definition at line 61 of file HTMLFileCache.php. Definition at line 69 of file HTMLFileCache.php. Definition at line 227 of file HTMLFileCache.php. References $title, $type, and as. Referenced by WikiPage\doPurge(), HTMLCacheUpdateJob\invalidateTitles(), WikiPage\onArticleDelete(), and WikiPage\onArticleEdit(). Definition at line 145 of file HTMLFileCache.php. References FileCacheBase\cachePath(), IContextSource\getOutput(), IContextSource\getTitle(), FileCacheBase\useGzip(), wfClientAcceptsGzip(), and wfDebug(). Use this as an ob_start() handler. Normally this is only registed as a handler if $wgUseFileCache is on. If can be explicitly called by rebuildFileCache.php when it takes over handling file caching itself, disabling any automatic handling the the process. Definition at line 188 of file HTMLFileCache.php. References FileCacheBase\saveText(), FileCacheBase\useGzip(), wfClientAcceptsGzip(), wfDebug(), and wfTimestampNow(). Get the cache type subdirectory (with the trailing slash) or the empty string Alter the type -> directory mapping to put action=view cache at the root. 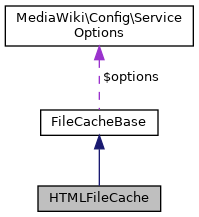 Definition at line 79 of file HTMLFileCache.php. Definition at line 93 of file HTMLFileCache.php. References $query, $user, as, IContextSource\getLanguage(), IContextSource\getRequest(), IContextSource\getUser(), Hooks\run(), and wfDebug(). Referenced by Article\isFileCacheable(), MediaWiki\main(), HistoryAction\onView(), and MediaWiki\run(). Definition at line 34 of file HTMLFileCache.php. Definition at line 35 of file HTMLFileCache.php. Definition at line 36 of file HTMLFileCache.php.